Who is the Janome 2212 Sewing Machine For? Decision Time: Is this Sewing Machine for You? 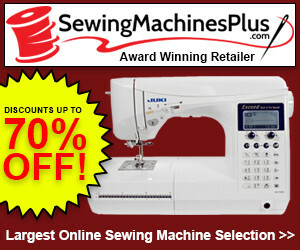 Love to sew and are looking for your next great sewing machine? The Janome 2212 Full Disclosure: We earn a commission if you click this link and make a purchase, at no additional cost to you. sewing machine might be just what you are looking for. With so many options out there, it is hard to know what to look for in a great sewing machine. Thankfully, this sewing machine has a little bit of everything. It is easy to use, features common stitches, and will hold up well to constant use. We had the chance to try it and liked what we saw. Let’s take a look at what this machine is all about. This machine from Janome comes with 12 built-in stitches. You get a straight stitch, a buttonhole stitch, decorative stitches, zigzag stitches, and a reverse stitch. You will see the stitch guide at the top of the machine with an easy-to-use dial to select the correct stitch. Simply turn the dial, and you are ready to get sewing. At the top of the machine, you will also see another dial. By turning this dial, you can quickly change the length and width of your stitches. This Janome sewing machine gives you the opportunity to place the needle in one of two positions, depending on your sewing project. This is great if you are working on different thicknesses of fabric and want the stitches to remain smooth. With one simple action, you can switch between the two positions. The included drop feed dog will allow you to switch between regular stitching and free-motion stitching or quilting. When the machine is in operation, the drop feed dog will always remain in an upward position. When not in use, the drop feed dog will be in the lowered position. You can reverse stitch with this machine too. On the face of the machine, above the needle, there is a switch. Flick this switch, and you can sew in reverse, reinforcing stitches when needed. You can also stitch in reverse if you want to add regular or decorative stitches in reverse. The needle plate on the sewing machine comes with a measurement and seam guide built in. As you are sewing, you can check your measurements on the fly. There is also a lamp in this same area to keep you illuminated when you are working; you never need to suffer from low-light conditions ever again. This is great for when you are threading your needle or investigating a jam. You can use this machine to sew on a variety of fabrics. The most common fabrics which you will use, including cotton, wool, linen, silk, and satin, will have no problem going through this machine. The machine can also handle thicker fabrics, and it is extremely easy to change the needle position depending on the thickness or weave of the fabric. We did not experience any jams but, if you do, it is easy to get back to sewing with minimal fuss. You do not need to remove the fabric you are working on if you do get a jam. The fabric can stay in place, and you can get into the bobbin without having to disturb your project. The bobbin is front-loading and easy to access. When it comes time to set this machine up, you will find that you can almost do it intuitively. We recommend that you use the instruction manual the first few times you use the machine, but after that, it will become second nature. We always like a built-in thread cutter, and this machine delivers that. It’s expected that most modern machines come with one included, but there are many out there which do not. We cannot convey the inconvenience of having to stop your work to cut your thread. A thread cutter will keep your project moving at all times. We like how easy this machine is to use. If you have never used a sewing machine, then you can pick this one up and get started almost straight away. Many newer machines come overloaded with numerous stitching options and a screen to navigate through them all. With this machine, you have a simple selection of stitches and a simple way to choose from them; with a small turn of the dial, you can select your stitch, and with a small turn of a second dial, you can adjust your length and width. The Janome 2212 sewing machine Full Disclosure: We earn a commission if you click this link and make a purchase, at no additional cost to you. is not confined to only one type of user. Experts will not get a lot from this, especially if they are working on more complicated projects but intermediate and novice users will find a lot to like about this. It is easy to use and still has a lot of power. This would not be a great sewing machine for a business owner. If you are working on complex or advanced projects, then this machine is not going to give you what you need. With expert users in mind, we would recommend the Singer Quantum Stylist 9960 Full Disclosure: We earn a commission if you click this link and make a purchase, at no additional cost to you. sewing machine. For intermediate and beginner users, there is enough here to work on lots of projects. If you are a professional seamstress or running a sewing business, you are going to want a more advanced machine. The Singer Quantum is exactly that. This sewing machine comes with everything you need to get started, but there is one thing which we would recommend buying. The working area is smaller than rival machines. You have enough room to do your work, but the machine could do with a little more working space for larger projects. If you can buy an attachment to give you a larger working area, it might be a wise investment. The Janome 2212 Full Disclosure: We earn a commission if you click this link and make a purchase, at no additional cost to you. sewing machine has a lot to it, though it may seem simple at first. It is a great sewing machine for anyone working on craft projects. 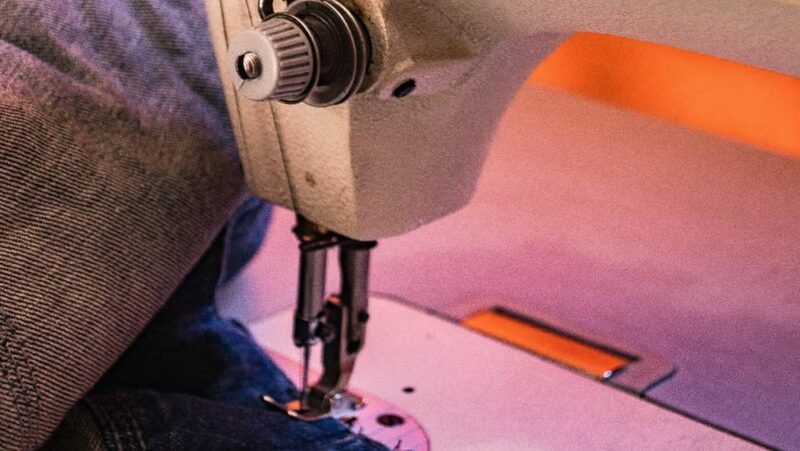 For larger projects, this sewing machine is not going to cut it, but for all of your smaller craft projects, this machine is going to be able to handle them. The great thing about this machine is that beginners can use it easily but will not need to necessarily progress to a different machine when they improve their sewing ability. The machine has enough power to keep you engaged through years of projects. 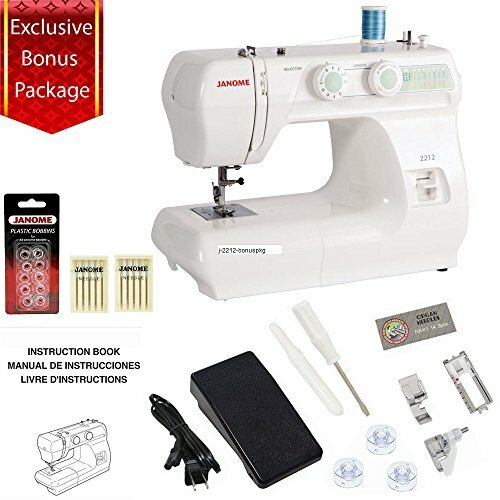 If you want to start a business or engage in professional sewing projects, another machine would be beneficial but, until then, this machine is great. The machine is easy to use, has limited jams, and you can keep your project flowing, moving from forward-moving stitches to backward stitches at the drop of a hat. The Janome 2212 sewing machine came in at #6 in our Best 12 Sewing Machines List. Here’s the full list, including the other 11 sewing machines. The following links will take you to the review of each machine. Janome 2212 Full Disclosure: We earn a commission if you click this link and make a purchase, at no additional cost to you.